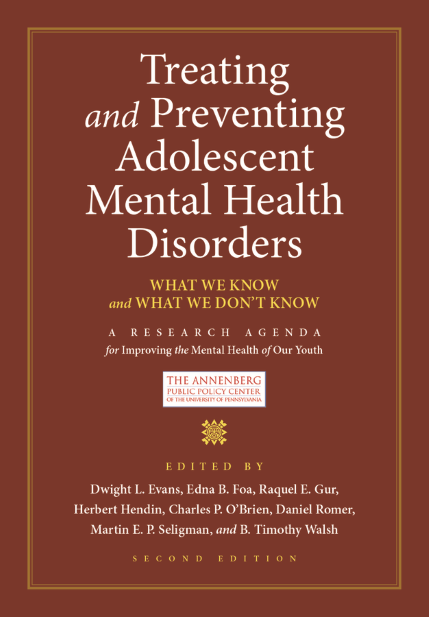 The second edition of Treating and Preventing Adolescent Mental Health Disorders: What We Know and What We Don’t Know is an extensive overview of the major mental health disorders that emerge during adolescence. The new edition provides a substantive update to the acclaimed original published in 2005, and includes new sections on gambling and internet addiction, as well as the changes in DSM-5 diagnostic criteria issued since the first edition. The volume presents the latest in treatment and prevention of major adolescent disorders, and updates the work of seven commissions under the Adolescent Mental Health Initiative convened by the Annenberg Public Policy Center and the Annenberg Foundation Trust at Sunnylands. Six of the groups pooled their expertise on such areas as adolescent anxiety disorders, schizophrenia, depression and bipolar disorder, eating disorders, substance and alcohol abuse, and suicide prevention, while the seventh commission examined positive youth development.